After three months in a new job, are you up to speed? Will you sink . . . or swim? Transitions into new roles are the crucibles in which leaders get their toughest tests, and they're the defining factor in professional careers today. Yet far too often, leaders fail to transition effectively into new roles. The resulting costs are high, for your career and the organization. 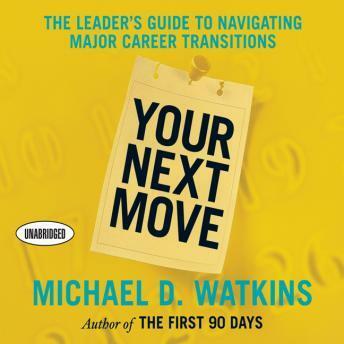 In Your Next Move, leadership-transition guru Michael Watkins shows how you can survive and thrive in all the major transitions you will face during your career, including promotion, on-boarding into a new organization, and making an international move. With real-life examples and case studies, he illustrates the defining hurdles associated with each type of transition. He then provides the insights, strategies, and tools-including relationship reengineering, business systems analysis, and 'organizational immunology'-you'll need to accelerate through these crucial turning points and continue moving up in your career. The necessary complement to the author's bestselling guide The First 90 Days, Your Next Move offers the keen observations, tried-and-true management wisdom, and practical good sense Watkins is renowned for. It's a vital resource for any manager or executive seeking to maintain career momentum.